Happ to the bench with two fouls at 13:12. He's 5-for-6 from the floor. Rest of the team 7-for-31. UW leads 35-31. Brevin Pritzl now in the game. #Badgers bring Pritzl in with 12:19 left. Brevin Pritzl checks in for #Badgers . Line change after a Trice turnover. Pritzl, Brown, Happ and Koenig now in. Only Iverson remains. #Badgers have 6 assists and 11 turnovers. Four empties in a row, three consecutive turnovers for UW, which leads 35-31 with 11:46 left. 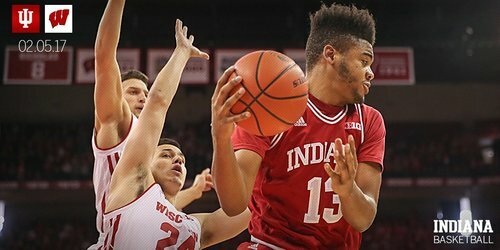 IU's Bryant can't find room inside and travels again. #Badgers ' lead is 35-31 with 11:46 left. 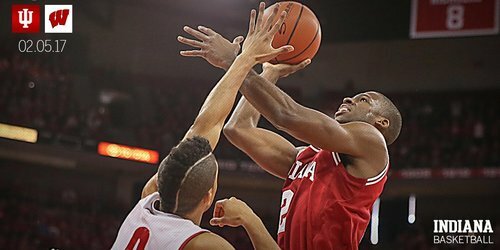 Wisconsin's frontcourt smothering Thomas Bryant on virtually every low-post entry pass. Three turnovers for Bryant in the 2nd half. 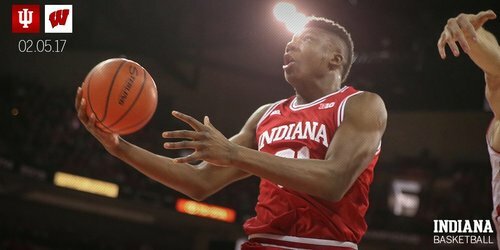 Josh Newkirk is first in double-figures for Indiana (10 points) and has IU’s last 5. IU's Bryant had 9 pts in first half. Has not scored this half. Just one shot. UW is 2 of 14 from 3-point range today, 12 of 62 (19.4 percent) over its last 5-plus halves. Ethan Happ has a game-high 14 points for the #Badgers to go along with 6 rebounds, 2 blocks, 2 steals, 1 assist. #Badgers Pritzl with nice ball-fake and drive for two. #Badgers with three consecutive hoops in the lane. Nigel finishes off the 3-point play at the free throw line and the #Badgers lead by 7 with under 9 minutes to play. 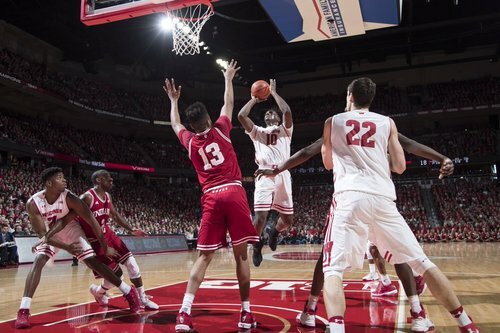 3-point play for Nigel Hayes, and a big look of relief on his face. Hayes up to 10 pts and 7 rebounds. #Badgers 5 for last 5. UW had scored on 5 possessions in a row until that miss by Koenig. #Badgers up 47-40, 6:18 left. Wisconsin with points on five of its last six possessions and leads 47-40 with 6:18 remaining. Happ leads all scorers with 18 points. #Badgers in bonus rest of the way. they are 12-15 from the line today. Brevin Pritzl out here breaking ankles. ???? The #Badgers are now 15 of 19 from the line -- Showalter will be there when play resumes -- and lead 52-48 with 3:49 left. #Badgers shooting 65.7% from line before today. They are 15-19 today (78.9%) and Showalter has 2 coming up. Ethan Happ leading all scorers with 18 points, while Nigel Hayes has 12 for the #Badgers . Wisconsin leads 52-48 with 3:49 remaining. Badgers 17-for-44 from the field but 15-for-19 from the free throw line. Brevin Pritzl playing in crunch time. #Badgers up 4 with 3:49 left. Ethan Happ with his third block of the game and gets the timeout as he's falling out of bounds. 54-50 UW with 2:34 remaining. Wisconsin leads Indiana, 55-50, with 2:00 to go. Zak Showalter with a huge 3-pointer with 1:37 remaining to give the Badgers a 58-50 lead. Happ with the assist.